When you homeschool, it's never an easy task, and one of the most important aspects is to have an organized learning space. That's why today I'm going to share my steps on how to have a structured homeschool space and I hope these ideas will help make your educational journey more organized for effective learning. It is important to separate educational stuff (books, stationary etc.) from home stuff, and it keeps young kids from ruining any books or worksheets. It also helps the school kids to have a space to go to anytime, so that they can complete their work. We use our dining room space, which has a desk for myself to use as my 'teacher' area, and to store my stationary and teacher supplies, calendar etc. I also work one-on-one with my children there. 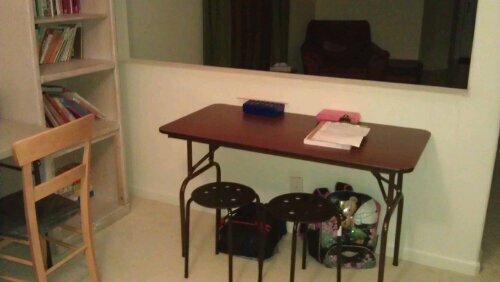 My desk is at one corner of the room, against the wall and above my desk I have a hutch (but you can add shelves). In the hutch I keep my teacher manuals, printer, laminator, binder and our 'treasure chest' (rewards for excellent work or behavior). We have three strong folding tables (this can be purchased at a warehouse or office supply) where my two oldest kids (grade 5 and grade 3) sit. My two middle kids (grade 2 and Kindergarten) sit at the other table. The third table we use for media or reading. This makes it easier to separate the independent learners from the dependent learners. From the kids listening to media or doing research. From the kids needing more concentration and who need to write. They each have their own stools for them to sit at their desks. On one wall, I put up two white boards where I explain concepts visually, set reminders or notifications, write signs, or facts for the day. We also have a cork board which we pin up schedules, permanent notices, or showcase outstanding pieces of work. On the other wall we have two bookshelves which hold all my children’s literature. One book shelf holds fiction books, and the other shelf holds non-fiction books and reference material. The desk in between the bookshelf is where my children sit to do research and reading using a CD player, computer or reference books. Against another wall in our learning room, close to my desk, I have a another storage shelf. This serves as a teacher storage area to store tubs of learning resources (flash cards, math cubes, abacus etc.) or anything else that a teacher needs. On the very top of the shelves I put crates filled with spare stationery supplies, books and anything else that we do not use often. On the lower shelves, I place plastic shoe boxes with all our stationary needs (crayons, paints, scissors glue, crafts, stickers, beads etc.) and label each one to make it easily accessible for the big kids and inaccessible for the little kids to mess. The plastic drawers hold construction paper, cardboard, and big stationary tools such as stapler, punch etc. Each of my kids have a school bag that holds their pencil box and the workbooks that they are using for the school year. They find this much easier for storing their work and accessing it when they need. This idea has worked for us but there are moms who may like a more relaxed homeschool approach. I feel that with many kids and with older kids, the structure helps them to stay focused and productive. However, if I was homeschooling less kids or younger kids, I would keep it more relaxed and implement lighter structure. It all depends on what works for you and your children. I have tried both structured and relaxed, and I have alternated between each of them when the need arose. You can't have a one-track mind when you homeschool because your days evolve so much according to age and circumstance. Therefore I suggest that you stick to what makes your child learn the best and don't be afraid to be flexible.